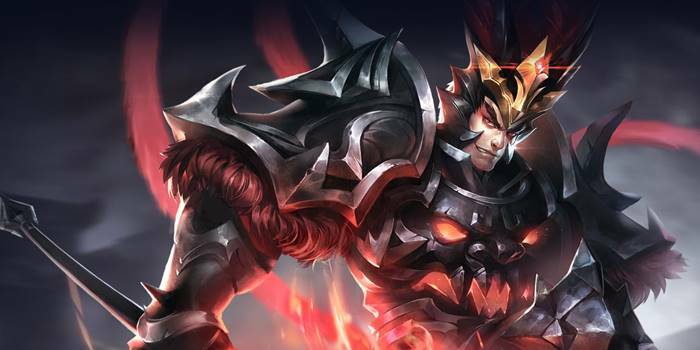 Lu Bu Item Builds Guide for Arena of Valor (AoV). Each build is geared toward a different play style, so choose one that fits your personal preference. These items are necessary in order to play Lu Bu optimally. Only diverge from a core item if you are a very experienced player or you have a very good reason for doing so. Spear of Longinus Spear of Longinus grants Lu Bu some tankiness along with a decent damage bonus and some nice cooldown reduction. The armor pierce its passive offers increases the potency of all of Lu Bu’s attacks as well as those of his physical teammates. Frost Cape Frost Cape gives Lu Bu some additional defense against physical damage. This item grants decent amounts HP and armor stats while keeping him nice and close to his enemies. Rankbreaker Rankbreaker is a good offensive option for Lu Bu. The armor pierce it provides will help the warrior slice through enemy defenses so that he can tear them down more quickly. Fafnir’s Talon Fafnir’s Talon empowers Lu Bu’s normal attacks with additional damage that peels away a percentage of the opponent’s life. The stats it provides are nice additional boosts to his attacks, raising his attack damage and speed. Hercules’ Madness Hercules’ Madness is a good defensive option for Lu Bu, offering armor, magic defense, and a shield whenever his health falls too low. The additional offensive stats that it provides while the shield is active makes it a good hybrid item for Lu Bu, giving him more time to benefit from his ultimate. Medallion of Troy Medallion of Troy covers Lu Bu’s defensive needs with regards to magic. This item helps him deal with magic damage in the form of a magic absorbing shield. It additionally provides some health as to not be completely geared towards magic and some nice cooldown reduction as well. Hyoga’s Edge Hyoga’s Edge is another viable defensive item for Lu Bu. Similar to Hercules’ Madness, this item provides an excellent range of defensive stats. Its Biting Cold passive is what makes the item really shine, allowing Lu Bu to stick onto enemies by slowing them and accelerating his own movement speed. War Boots can be a good choice for Lu Bu when focusing more on damage than defense. The attack speed it provides will help Lu Bu attack more frequently as well as benefit more from both his passive and ultimate abilities. Gilded Greaves Gilded Greaves is the most common choice for Lu Bu. The resistance it provides stacks with his ultimate, allowing him to shake off disables extremely easily. Sonic Boots Sonic Boots is a decent substitute for Gilded Greaves when the enemy team is heavy on physical damage dealers. The armor and damage reduction the upgrade provides will make Lu Bu much more resilient to normal attacks. This build focuses on turning Lu Bu into a chunky frontliner who is able to get into the center of a fight and disrupt the enemy team. While each item offers a distinctly defensive set of stats, their passives modify Lu Bu’s damage output and ability to stick to opponents. Despite the heavy focus on durability, he will be far from useless when the time comes to bring some pain onto the enemy team. Here we build Lu Bu’s damaging potential over defensive stats, taking more of a dps role on the team. Fafnir’s Talon and Omni Arms will considerably beef up his normal attacks while also allowing him to sustain his health by way of life steal. While not completely helpless to enemy attacks, he will be much squishier than otherwise when running this build, so players will need to be much more careful in their approach. This build is centered on utilizing his mobility in the jungle so that he can easily gank enemies in lane and maintain control over the Abyssal Dragon. Soulreaver is his jungling item of choice, it ramping up his attack damage with each jungle minion he kills up to a cap. Spear of Longinus and Frost Cape take advantage of how frequently Lu Bu casts abilities, the former ripping away opponents’ armor each time one hits and the latter offering Lu Bu a slow each time he casts one. The items together offer max cooldown speed as well, further allowing Lu Bu to spam his free abilities. He is kept from becoming overly squishy through a number of defensive stats that these items provide along with the primarily defensive Gaia’s Standard. A rather standard bruiser build for Lu Bu to keep him both tough to outside attacks and able to dish out some punishment. Each item fits him well, however players might need to shift their playstyles to fit the large suite of hybrid items. He might not hit as hard early for players used to building him more aggressively or be quite as durable to players who build him defensively. That said, the flexibility that the hybrid items offer will allow Lu Bu players to succeed in many more situations than more specialized builds allow. I also suggest the optional item despite adjusting to enemy hero.. Build Idea: Mantle > FlashyB > Longinus > Troy > Fafnir’s > Hercules. You don’t have any shoes in this build and don’t mention it in the description. Is this intentional? Thanks for pointing this out! Had my eye on other areas when updating the page so missed the screwing links. Sorry for the sloppiness.